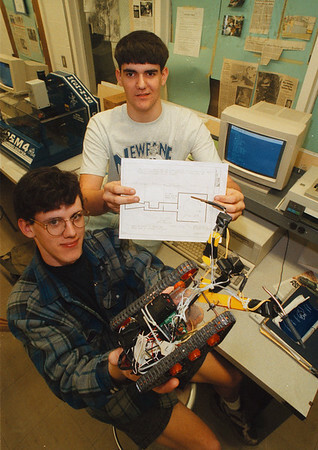 5/1/97 Newfane Robotics - James Neiss Photo - L-R - Chad Taylor 18/12 and Bill Scott 17/12 won 1st place in the "Self Controlled Journey Robot" with their " Jerky Bot - 101" robot, at the Society of Manufacturing and Engineers Robotic Competition at Ohio Northern University. The robot is controlled by light sensitivity and would go forward following white and turn when it encounters Black. Bill Scott is holding the course outling.